The grocery industry, like many industries out there today, is operating with razor-thin margins amid an ever-changing marketplace. Grocery delivery services have been around awhile, but now with Amazon and others taking the shopping experience out of the equation for customers, brick-and-mortar stores are scrambling to keep up and keep people coming into the store. Grocers need to find new ways to attract shoppers, and increasingly that means giving people something the internet can't — an experience. Whether it's greeting customers by name, increasing the amount of tastings and samplings done in store, or otherwise interacting with people, this means it's all hands on deck when the store is open for business. That's why it's critical to streamline back-of-the-house processes, especially cash handling. Mixed bill processing: Count cash and denominate 33 percent faster than comparable currency counting models — up to 1,600 mixed bills per minute — to end shifts on time. Check scanning: Process checks at 400 documents per minute. Reduce overtime costs, extend deadlines and improve employee morale. Four levels of memory: Keep separate totals for sub-batches, batches, day totals and strap limits. Paired with the Money Machine 2, a self-service coin machine, grocers are getting a win-win-win. They're delivering better customer service by automating cash and check processing, they're giving the customer the valuable service of coin counting, and they're eliminating the cost of purchased coin. 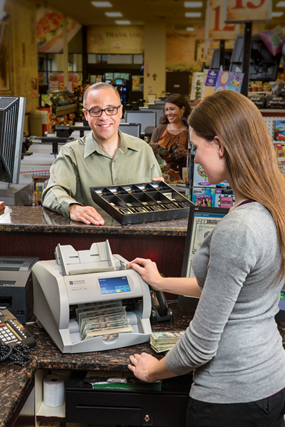 Streamlining cash management and increasing efficiency will give grocers time to devote to Job One: Providing stellar customer service.